﻿﻿﻿﻿﻿﻿﻿Increase your chance for hunting success next year by starting now. As you savor the satisfaction of the close of another hunting season, don’t get too relaxed. It’s already time to start planning ahead — next year’s success hinges on this year’s post-season scouting. During the post-season, you can freely move about. As you scout your area, patterns will emerge that you may have missed during the hunt. All of last season’s signs are still readily evident: rubs and scrapes, feeding and bedding areas, major runways and escape routes. Early spring brings shed antlers to indicate which bucks made it through the winter, valuable information that allows you to target specific ones next time. Here are important factors to keep in mind during your post-season scouting. Food and Water. Search out food sources, but not just the most obvious agricultural sources and feeders. Many deer, including the most skittish bucks, rely heavily on natural sources, too. Grapes, pokeweed berries, persimmons and acorns (especially white oak) are great high-energy foods that sustain deer during the rut and help add body fat in preparation for winter. Locate these sources and know when they drop or ripen, and you’ll have a leg up on other hunters. If there are water sources where you hunt, look for easy access points and locate trails leading to and from them. Beds. Bedding areas are also a critical piece of the whitetail puzzle. Deer in high-pressure areas spend a great deal of time in and near bedding areas. Locate beds in thick, inaccessible spots relatively near food sources. You know you’ve found a doe bedding area when you find multiple oval depressions of varying sizes, indicating a family group. Buck beds are solitary, away from other deer, and in thick, nasty cover. Wily bucks may bed in tiny oak mottes that you would least suspect. Bedding areas can be great places to find shed antlers, too. Deer often stretch and shake upon standing; many times, that movement will detach a loose antler. Funnels. While scouting, look for funnels — areas where either terrain or vegetation restrict deer movement into a narrow area. These can prove to be hot spots for hunting, especially if they connect bedding areas and prime feeding areas. These travel routes will often also contain rubs and scrapes. Rubs. 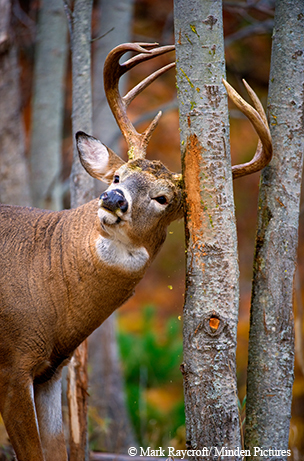 Bucks will leave marks when they rub their antlers on small trees. These rubs are a clear sign of a travel lane. Many times, rubs will be found in a line adjacent to trails. Take note of which side of the tree the rubs are found and you’ll be able to piece together the direction of travel. These travel routes may be used by deer year after year. Scrapes. Scrapes are oval depressions bucks create by pawing up the soil and then urinating in the depression. They are signposts left to advertise dominance. Bucks leave additional scent markings on overhanging branches using glands around their eyes and forehead. Access. Take the time to choose routes into and out of your new prime hunting areas. In choosing your access routes, consider wind direction and cover and how you’ll utilize those factors to get to and from your stand area in the dark. Notes. Don’t rely solely on your memory — record your observations. This can be done in a variety of ways: the old-fashioned way using a journal with sketches and hand-drawn maps, or electronically on your smartphone with digital maps, coordinates and notes. Knowledge of all these signs considered as a whole will allow you to greatly enhance your understanding of deer behavior and improve your chance of success. Often, the best predictor of hunting success is hard work and preparation. Make your own luck by starting in the post-season.